The new date for the match between Manchester United and Chelsea which was washed out due to heavy snowfall in London has been announced.The match has been rescheduled to March 1 2011,Tuesday.This was announced on Chelsea official website. 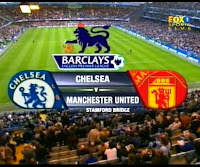 Earlier United and Chelsea were to clash on Sunday 19th December 2010, in which both Red's and Blue's supporters were waiting very anxiously for the all important clash of the Premier League, until their wait had to be posponded due to heavy snows and bad weather conditions in London. The match will kick off at 19:45 GMT at Stamford Bridge.This match is subject to neither team being involved in an FA Cup fifth round replay. Should both Manchester United and Chelsea be knocked out of the FA Cup prior to this date the match may be placed on to an FA Cup weekend. This match was supposed to an important one and importantly most anticipated of all, with their rivalry known to every one.